Ever since Madewell started including customer reviews on its product pages, our shopping experience on the site has greatly improved. There's nothing that quite compares to a firsthand account of the pros and cons of a piece of clothing or an accessory, especially when it comes to an item with a tricky fit, like skinny jeans. Since we're well aware that Madewell is one of your favorite sources of both classic wardrobe builders and wearable takes on the biggest trends, we reached out to the brand (and did a little digging of our own) to get the scoop on the current pieces with the best (and most) reviews. They filled us in on four tried-and-true classics and one new piece that get tons of traffic and buzz, and we rounded the list out with an assortment of others that we found to have seriously impressive reviews. 4.8/5 stars, 42 reviews, recommended by 95%. 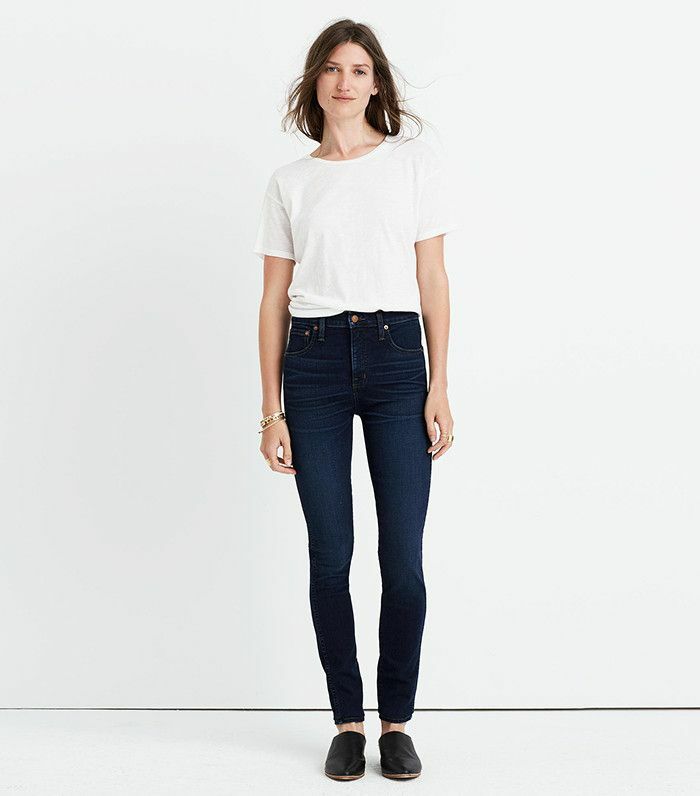 One reviewer said of these flattering skinny jeans, "These are the best jeans available to humanity. You can stop looking now." 4.6/5 stars, 68 reviews, recommended by 94%. Reviewers rave about the amazing quality of this sleek leather jacket. 5/5 stars, three reviews, recommended by 100%. One reviewer said of this new arrival, "It is soft, comfortable, and true to size," while another said, "I want to buy 10 to have them forever." 4.3/5 stars, 47 reviews, recommended by 80%. This tote is the perfect size for work. 4.4/5 stars, 19 reviews, recommended by 89%. Reviewers agree this cozy staple is worth the money. 5/5 stars, one review, recommended by 100%. A high-quality pair of leather leggings for less than $500 is a rare find, especially when they're this perfect. 4.5/5 stars, 48 reviews, recommended by 96%. According to many reviews, these are super comfortable. 4.4/5 stars, 11 reviews, recommended by 88%. The consensus is this tank is ultra flattering. 4.5/5 stars, two reviews, recommended by 100%. We can see why this stylish denim skirt is quickly selling out. 4.8/5 stars, eight reviews, recommended by 100%. One reviewer called there her "new favorite work pants." We'd have to agree. 4.3/5 stars, 12 reviews, recommended by 82%. Madewell's denim jackets will never go out of style. 4.3/5 stars, 101 reviews, recommended by 89%. Reviewers applaud the nice, sturdy weight and flattering fit. 4.1/5 stars, 40 reviews, recommended by 78%. Reviewers rave that this soft, cozy sweater doesn't itch. 4.3/5 stars, 127 reviews, recommended by 87%. We love these even more with a monogrammed waistband (a mere $10 extra). 4.6/5 stars, 20 reviews, recommended by 94%. You can never have too many white shirts. This one earns praise for its "lovely" fabric. 4.8/5 stars, 20 reviews, recommended by 95%. One reviewer sums it up best in saying, "I'm tired of skinny jeans and these are a perfect replacement. The high waist looks great and is surprisingly comfortable."